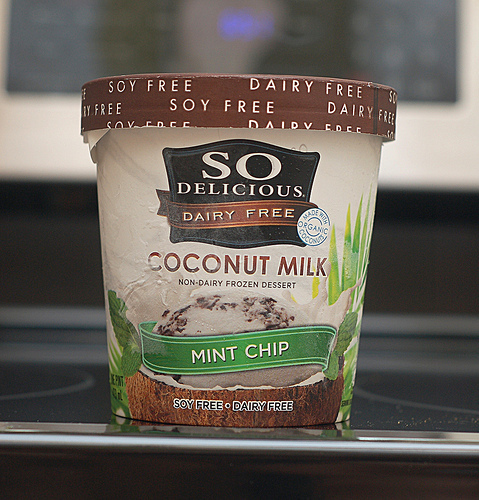 Posted on October 31, 2013, in Food and tagged "non-dairy", coconut milk, dairy free, desert, Food, frozen dessert, gluten-free, Ice cream, mint, mint chip, Organic, so delicious, soy free, sugar, sweet, Sweets. Bookmark the permalink. 2 Comments. Not really fair to compare it to milk products. Those of us are eating it because of a dairy intolerance. When you can’t do milk, almond and coconut are our alternatives. So delicious is very good and has lots of options for us non-dairy people and I think they do a great job providing us an alternative that tastes good.